people often ask me why i’m vegan, and honestly, i haven’t found a reason not to be; so i decided to do a number of little clips that have bite-sized information about different reasons to go vegan! let’s start with our first reason to go vegan – environmental impact. 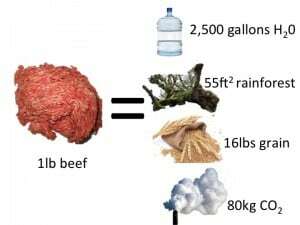 in order to make one pound of beef, we have to use two thousand five hundred (2,500) gallons of water, fifty-five (55) square feet of rainforest, sixteen (16) pounds of grain and and eighty (80) kilograms of co2. you can save more water by not eating one pound of beef than you can for not showering for an entire six months! then there is the land that we use, the equivalent of seven football fields is bulldozed every minute worldwide in order to make more room for farmed animals. animal agriculture makes a 40% greater contribution to global warming than all the transportation in the world combined. it is actually the number one cause of climate change. it takes more than eleven times as much fossil fuel to make one calorie from animal protein as it does to make one calorie from animal protein. and if all of that isn’t enough for you, every second in the united states, eighty-nine thousand (89,000) pounds of faecal matter is produced by our farmed animals – oh yes, you heard that correctly – close to ninety thousand (90,000) pounds of poop every second with no waste management treatment. what we just went over is only scratching the surface of the environmental impact of the meat and dairy industries on our planet. for a more thorough look at the exact environmental cost of animal products, see this video! “I haven’t found a reason NOT to be vegan.” Exactly. It doesn’t matter where you start from (animal rights, health, environment…) you end up at the same place (vegan). thanks :) this was the first vegan nugget ever! Hi. Please see this one.